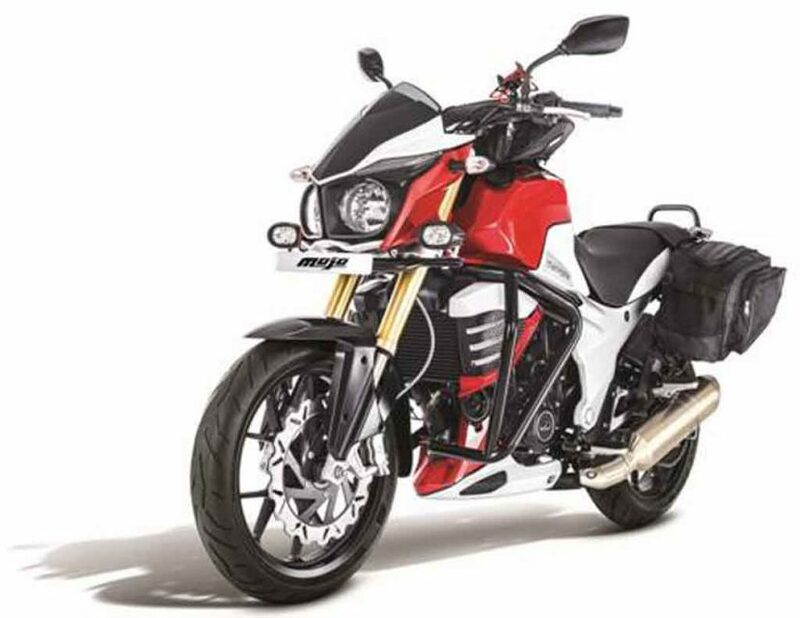 Bajaj Auto has launched the much-awaited flagship model, the Dominar 400 for the Indian market last week. The muscular looking bike’s name has been taken from Spanish language, where it stands for ‘Dominate’. Truly, the sporty looking performance cruiser has been designed in such manner that reflects style, power and masculine appeal. It closely follows the design showcased through the Pulsar CS400 Concept at the 2014 New Delhi Auto Expo. Earlier it was believed to come as the top-end model of the Pulsar lineup but later the bike-maker decided to launch it under a different sub-brand. Bajaj claims that this bike is the most affordable performance cruiser across the world in its category at present. While many customers are very excited to get their hands on the D400, the brand is planning something bigger with this model. It wants to go and sell the Dominar in potential global markets too. In India, this bike would take on the Mahindra Mojo and Royal Enfield Classic 350 in the 300 cc – 400 cc category and seems to be targetting the market share of Royal Enfield largely. The Royal Enfield Classic 350 is an established product with a huge customer base growing steadily – well over 30,000 units of average monthly sales is a testament to that. The retro feel of this model combined with the power packed performance, riding comfort and of course the ‘Royal Enfield’ brand name has made it very popular among the customers. Despite being a major carmaker in India, Mahindra & Mahindra entered and took on the two-wheeler business pretty seriously. The company launched its Mojo performance cruiser bike in 2015 and it has garnered positive response in short span. It comes as an aggressive looking performance sports tourer that stands as a close rival for the D400. 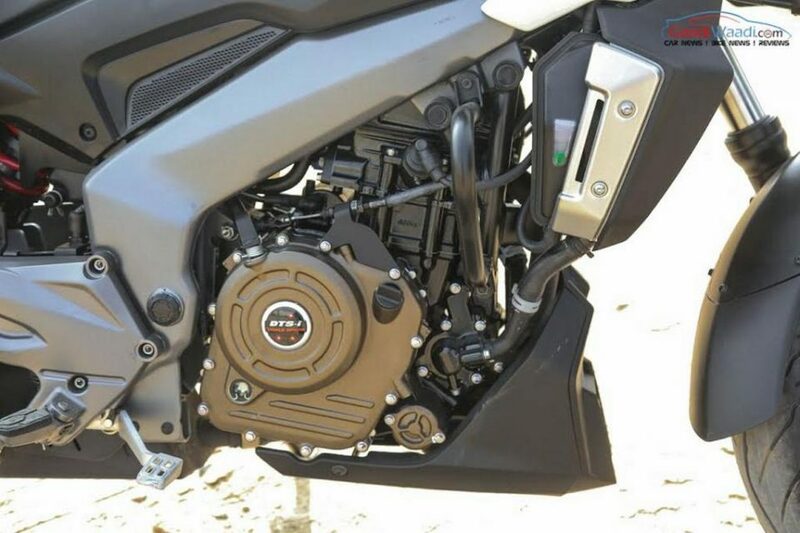 Bajaj Dominar 400 has been designed closely following the Pulsar CS400 Concept from the 2014 New Delhi Auto Expo. The production model carries the same aggressive styling which we have seen in the concept. It gets a sculpted looking full LED mosaic headlamp with balanced white light and Auto Headlamp On (AHO) technology. The D400 sports a Pulsar 200NS like silhouette clearly visible through the design. The Dominar is equipped with flat handlebar giving the rider better control over the machine. It features a fully digital instrument cluster with LCD display. Like the concept model, the production bike also gets a separate display on the chunky fuel tank. The sculpted appearance of the fuel tank itself enhances the masculinity of the D400. Apart from that, it receives the stepped up saddle seat instead of split seats, split grab rail and twin strip LED taillights. The exhaust muzzle, body cowl and alloy wheels help the Dominar in enhancing its style and visual appeal further. Royal Enfield Classic 350 is a widely popular motorcycle in the Indian market and in overseas markets as well. Its sturdy retro appearance certainly plays a charming factor for the customers. It sports a round shaped large headlamp with chrome garnishing, small circular analog instrument cluster, wide handle bar, a large and wide fuel tank. With the lower positioned comfortable rider seat, chrome finished exhaust muzzle, round taillight, spoke wheels, the touch of old-school charm is visible. Over to the Mahindra Mojo, this adventure tourer looks very aggressive with its unique design. The bike sports twin circular headlamps, LED guide lamps with eyebrow like appearance, analog-digital instrument cluster and a muscular fuel tank which can contain 21-litre of fuel. The fuel tank of the Mojo is certainly largest among these three, making it capable for really long journeys . The Mahindra Mojo also boasts a comfortable rider seat, narrow and compact pillion seat, split grab rail and a sleek taillight as well. 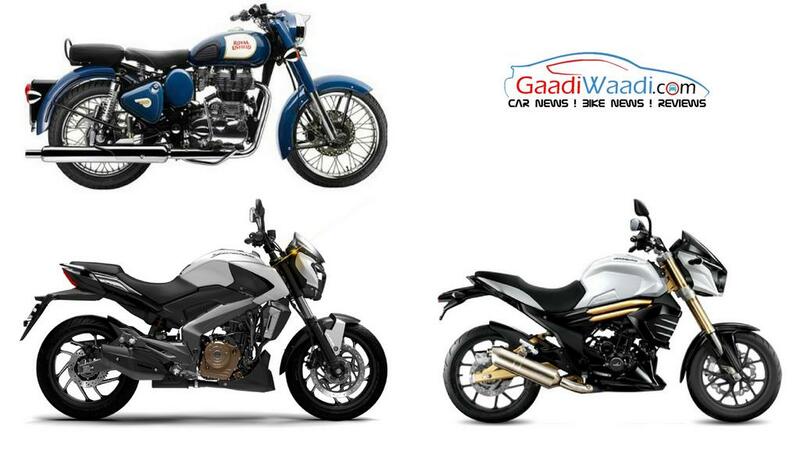 Its twin exhaust barrel with one at each side helps in enhancing the visual appeal. 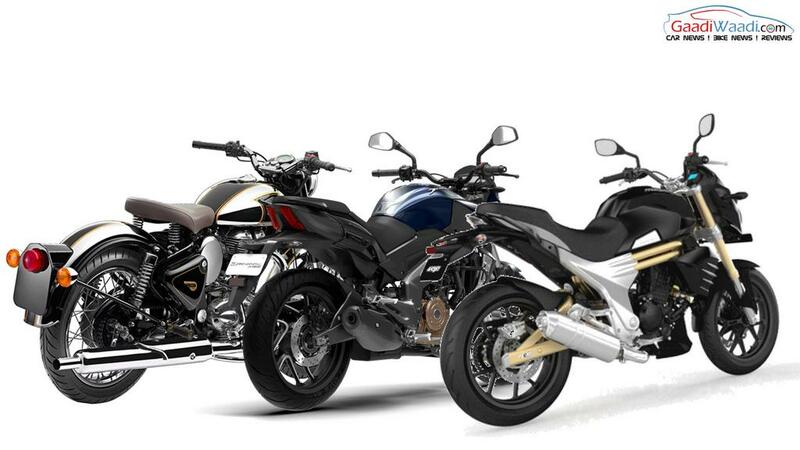 In terms of design, all these three bikes look different to each other and attractive in their own way with different take on modern designs. 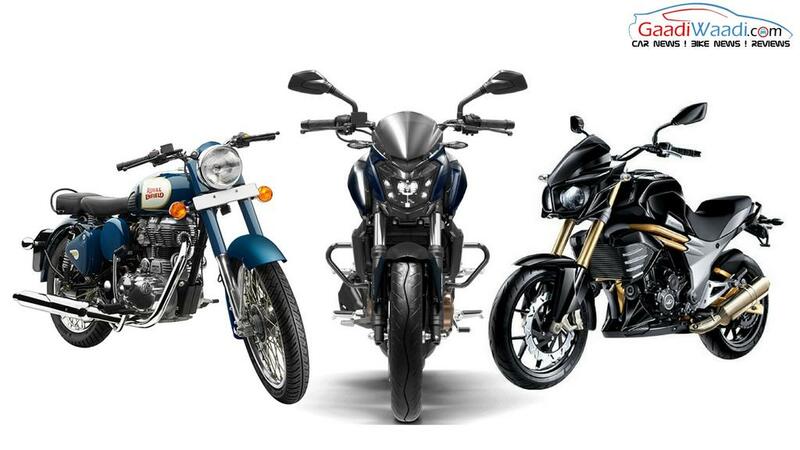 However, the Bajaj Dominar does look the most sporty, modern and contemporary while for the customers who love retro feel Royal Enfield Classic 350 is the choice. Mojo does have its unique band of customers too with a sleek appearance. Bajaj Dominar 400 gets power from a 373.2 cc single-cylinder, liquid-cooled, fuel-injected DTS-i engine shared with the KTM Duke 390. Paired with a 6-speed transmission, this engine churns out 34.5 bhp of peak power at 8,000 rpm and 35 Nm of peak torque at 6,500 rpm. 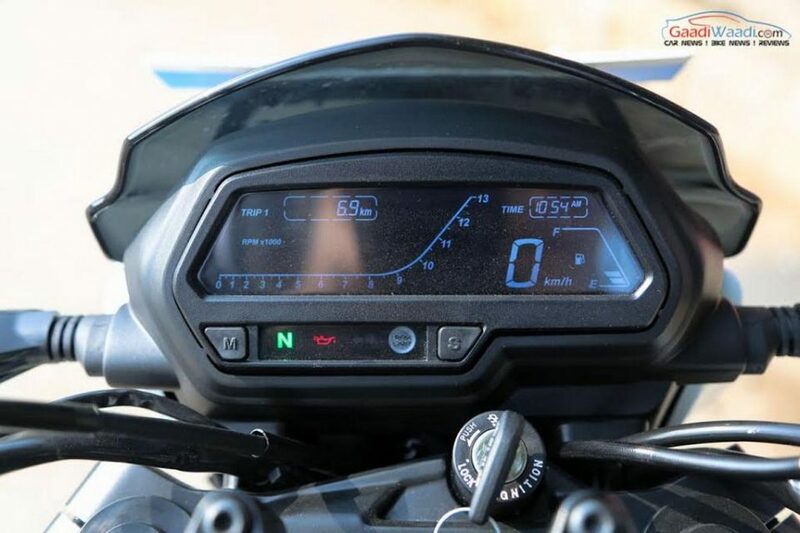 Bajaj Auto claims that the Dominar is capable to accelerate 0 – 100 kmph in 8.23 seconds with a top speed of 148 kmph. This bike delivers fuel efficiency of around 27 kmpl. Royal Enfield Classic 350 draws power from a 346 cc single-cylinder, air-cooled engine mated to a 5-speed gearbox. This engine kicks out 19.8 bhp of peak power at 5,250 rpm and 28 Nm of peak torque at 4,000 rpm. It returns a fuel efficiency of around 37 kmpl. It can accelerate 0 – 60 kmph in 3.20 seconds, while top speed of this motorcycle is 130 kmph. Mahindra Mojo on the other hand is powered by a 295 cc single-cylinder, liquid-cooled engine paired with a 6-speed transmission. This engine churns out 27 bhp of peak power at 8,000 rpm and 30 Nm of peak torque at 5,500 rpm. It returns fuel efficiency of around 25 kmpl. Mojo comes with a top speed of 147 kmph. So far, among these three bikes, Bajaj Dominar 400 is the most powerful one and the most handling tuned. No wonder, performance lovers will get attracted to this model very easily while the riders wanting a torquier motorcycle may opt for the RE. Mojo is the best of both worlds in this aspect as it has the power and torque to sit as a perfect alternative. Bajaj Dominar 400 uses top notch braking and suspension equipment. The urban sports cruiser gets a 320 mm front disc brake and a 230 mm rear disc brake. It is also equipped with an ABS variant, which gets twin-channel Anti Brake-lock System. For suspension duty it is equipped with large 43 mm telescopic front forks and multi-step adjustable monoshock absorber at rear. It runs on 17-inch alloy wheels wrapped in tubeless tyres. 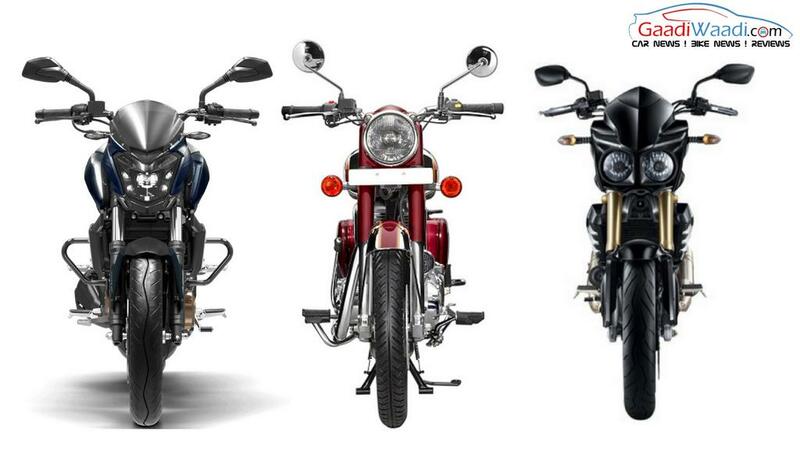 The Royal Enfield Classic 350 features a 280 mm front disc brake and 153 mm rear drum brake. Suspension duty in the motorcycle is done by 35 mm telescopic front forks with 130 mm travel, while rear gets 5-step adjustable twin-gas charged shock absorber with 80 mm travel. This motorcycle runs on multi-spoke 19-inch front and 18-inch rear wheels portraying an old charm. 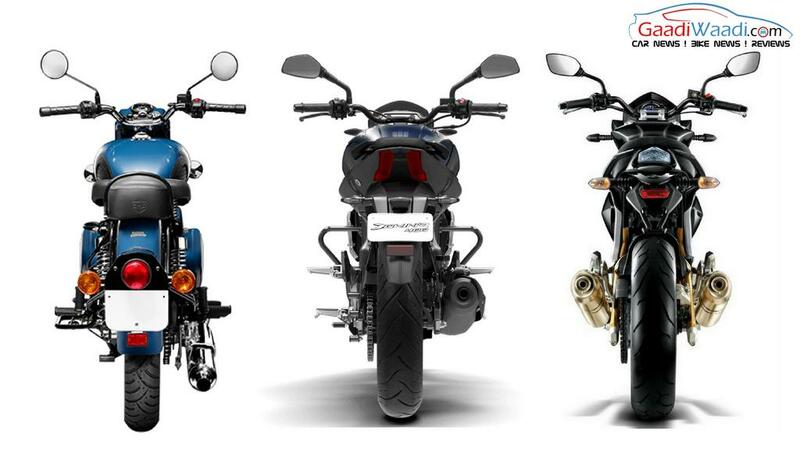 On the other hand, the Mahindra Mojo is equipped with 320 mm front disc brake and 240 mm rear disc brake. Suspension duty in this bike is handled by USD front forks with 143.5 mm travel and gas charged monoshock absorber at rear with 143.5 mm travel. This bike runs on 17-inch alloy wheels wrapped in Pirelli Diablo Rosso II tyres. So far, the Bajaj Dominar 400 is way ahead of its two rivals comparing the braking and suspension elements. Bajaj Dominar 400 looks promising from every angle. Be it style or performance, the all-new D400 seems well capable to impress the new-age customers. Being a stunning looking performance cruiser it has potential to attract the customers who seek speed, performance and power from their machines. At a pricing of Rs. 1.36 lakh (ex-showroom, New Delhi) for the non-ABS variant and Rs. 1.50 for dual-ABS version, it looks to be the most deserved winner here ticking all the VFM quotients. Being completely different styled and a more cruising oriented motorcycle, the Royal Enfield Classic 350 would be capable of holding its position against the Dominar as it has a dedicated rider base but as times goes on, the D400 is more likely to eat into its sales. 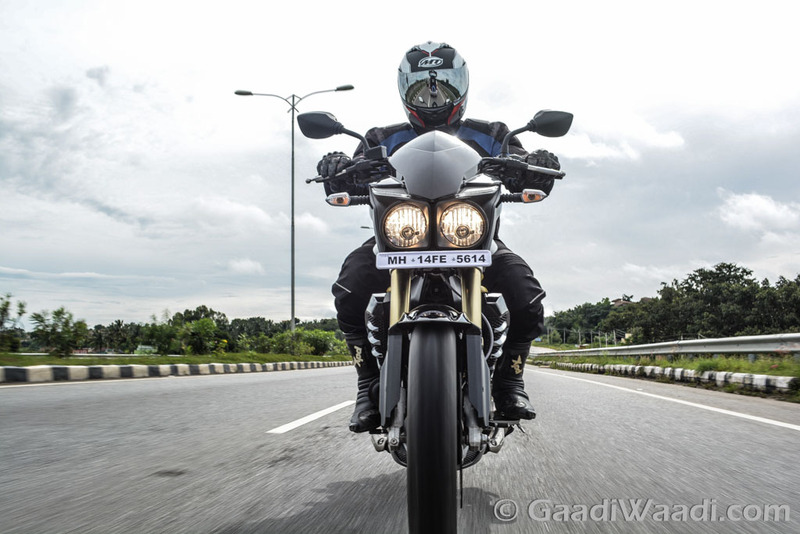 The Mahindra Mojo has reasons to be intimidated with the arrival of Dominar. Priced at Rs. 1.70 lakh (ex-showroom, New Delhi), the Mojo is surely a step behind in style, performance and equipment grounds but it is a highly capable product in its own rights. 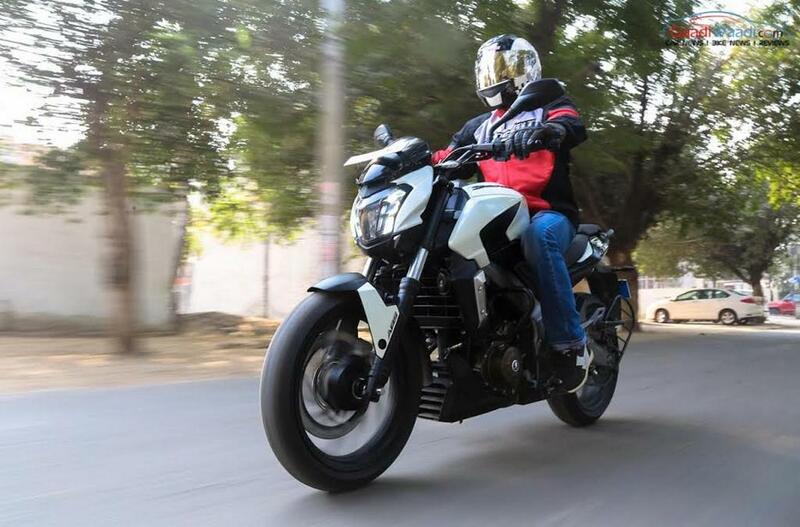 In our opinion, the Dominar seems the best buy among these three bikes considering all aspects and will carve a special place in the premium space for good.